Looking for a new snack option? You’ve got to try my new favorite, TRISCUIT Wheatberry Clusters. Did you know wheatberries are whole kernels of wheat that are roasted and clustered with real ingredients like fruit and nuts? Some of my favorite snack foods combined into one! How great is that? These light clusters are available in 3 flavors – cranberries and cashews, cherries and almonds and pumpkin seeds and sweet corn. The best part is these clusters are made with NO artificial flavoring and coloring and have 8g of whole grain in them. Along with that they are Non-GMO project verified which is very important to me. 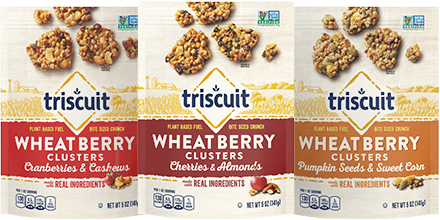 Triscuit Wheatberry Clusters are great to take on-the-go, since they are packaged in their convenient resealable bag for a crunchy snack any time! Head to your local Commissary and grab some of these NEW TRISCUIT Wheatberry Clusters. And be sure to check out www.NabiscoMilitary.com for even more Commissary deals on your favorite Nabisco products!